The Hotel Grinnell is one of the most unique hotels in Iowa. Once a school, this now chic and upscale hotel is all about having fun! We’ve never taken so many pictures of a hotel. Everything about the Hotel Grinnell was so unique and well thought out, though, that we wanted to capture everything! It’s the best hotel we stayed at during our road trip across Iowa and probably one of the most unique places to stay in Iowa. We loved everything about it! Here’s the thing… The Hotel Grinnell was once the city’s junior high school! It was built in 1921 and served the community for decades. Then in the 1970s it stopped being used as a school. Instead, the space was used here and there as offices or as a community center. Then came Angela Harrington, who had a brand new vision for the school. In October 2016, she purchased the property with business partner Steve Holtze and together they transformed the school into a modern and vibrant hotel. The classrooms have been converted into 43 guest rooms, the gymnasium into a ballroom, and the auditorium into a theater. Where the locker rooms used to be is now a fun restaurant called the Periodic Table. Everything is completely different, and yet they’ve stayed true to the origins of the building. As you walk in to the hotel into what used to be the principal’s office, you find a small front desk with a living wall behind it. On the day of our arrival, we were greeted by Amelia. She was super helpful, was a wealth of knowledge, and was kind enough to give us a quick tour of the hotel. There are 43 guest rooms in the Hotel Grinnell. Most have the original wood laminate from 1921, which we thought was really cool. Each room also has its own unique art; not one piece of art in the hotel is duplicated. Our room had a Star Wars theme. But more importantly, it had a beautiful and comfortable bed with pillowtop mattresses and Egyptian cotton sheets. Our bed also came with soft and medium pillows. Our room also came with a mini fridge, coffee maker, and a Smart TV that let us stream our own content. We loved that feature because we could pick up right where we left off on Netflix lol! The sink area and bathroom were also really nice. The hotel chose to use organic toiletries, which we really appreciated. What we especially loved about the Hotel Grinnell, and what makes it so unique, is how meticulous they are with details and accessories. Their design team really thought of everything! Our key card came in a small paper envelope that said “Hall Pass” and inside our room we found a chalk board as well as an apple and No. 2 pencil. There was even a tie on the door handle that said “Not Now” instead of the usual “Do Not Disturb” sign. How fun is that? We loved the school theme throughout the hotel! We found an apple and No. 2 pencil on our desk and a chalkboard on the wall. People love the tie so much, you can even buy your own at the front desk! The Hotel Grinnell has created such a fun space in their lounge area! There are board games, shuffleboard, and a giant Scrabble! Like it says on the wall, this area is the perfect place to play! Who wants to play Scrabble?? The Hotel Grinnell restaurant is called the Periodic Table. Fun, huh? You can sit down at a table or by the bar. There’s also an outside seating area with gas fire pits (if you get chilly, the hotel has wool blankets you can borrow.) Oh, and if you’re wondering, yes that is the old scoreboard that used to keep score during the school’s volleyball and basketball games! The Hotel Grinnell restaurant is where the schools locker rooms used to be! The Hotel Grinnell menu has a little bit for everyone and includes vegetarian, vegan, and gluten-free options. You’ll find both hotel guests and locals eating and drinking at the Periodic Table. During our stay we had the Carne Asada Tacos and a Cosmopolitan. Although the taco was served differently than expected, the flavors were really good. The hotel also offers a light continental breakfast where they serve cereals, breads, teas, and fair trade certified coffee from Kahawa Cup. Breakfast is served daily from 7 AM to 11 AM. A great way to start your morning in Grinnell, Iowa! No doubt the most popular event held on the property is a Hotel Grinnell wedding. As we stated earlier, the old gymnasium is now a ballroom, perfect for a reception of up to 350 people. And the old auditorium is now a 400 seat theater, also perfect for a wedding. We even got a sneak peek of the Penthouse Suite which is perfect for honeymooners. The hotel also has two bunk rooms with 10 extra long twin beds in each. These are perfect for bachelor/bachelorette parties, sports teams, family reunions, or just a bunch of gals looking to get away on a girls weekend in Iowa. Pro Tip: There are over 100 wineries in Iowa! Make sure to visit some while you’re exploring the state! The Hotel Grinnell is in such a convenient location to explore the city, unlike most hotels in Grinnell that are by the highway. It’s the only hotel in downtown Grinnell, and is within walking distance of shops, galleries, and Grinnell restaurants. The front desk will be able to point you towards fun things to do in Grinnell and can even lend you a bicycle for you to cruise around town in! 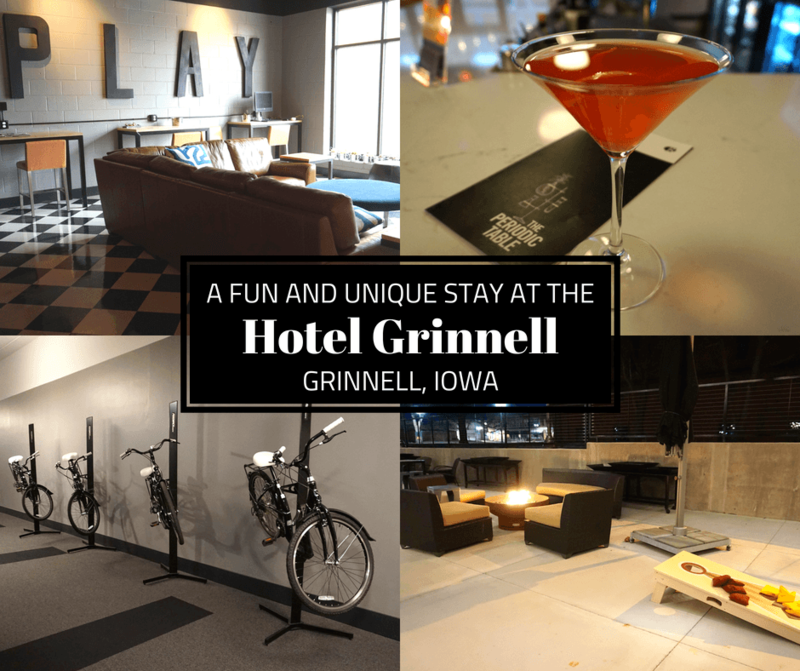 Grinnell is also only an hour away from three major metro areas, so even if you’re an Iowa local but looking for a weekend getaway, we think the Hotel Grinnell is perfect. – Fresh air is piped from outside into all rooms 24/7 to keep the building healthy and to optimize sleep. – You can buy adult coloring books from the front desk. – You can set up an appointment with an on-call masseuse. – All of the contractors used to renovate the building were local. – All of the tile in the hotel was set by Angela Harrington’s husband. – The industrial glass in the showers are in honor of the city’s industrial heritage. – All of the iron furniture was made in Sully, Iowa, only 20 minutes south of Grinnell. – The benches in the Bunk Rooms are re-purposed lockers. – The front desk has complimentary activity kits for your kiddos as well as treats for your pets. – You can text the digital concierge 24/7 with any questions or issues you have. We really did love everything about this hotel! They created a modern hotel, with all the bells and whistles, that still feels like a casual hang out spot. And we really enjoyed how the school theme throughout the property pays tribute to the property’s beginnings; the contrast between old and new is something we like to see. The hotel’s attention to detail is what really makes it so special and unique. Unlike chain hotels, there’s nothing cookie cutter about the Hotel Grinnell. We never thought we’d enjoy going to school SO much! That place looks fabulous! I want to go to Iowa! I love the looks of the inside of the hotel and would stay here, looks so modern but I am not a keen fan of the facade. It looks a bit industrilzed. But those beds sure look comfy. Were the chairs at the bar comfortable? Wow, what a fun makeover – I love repurposed hotels with inventive and colorful stays. I’m a fan of modern and organic and this actually has both and I know I would love staying here and enjoy all of the facilities. I love the idea of transforming an old junior high school into a hotel and I adore the idea of the front desk being the principals office. The hall pass key card, apple, pencil and not now tie are perfect, What a great property! I so appreciate how a hotel takes a theme and really runs with it. How better than to focus on your roots -school for adults! Really interesting place – I really admire there focus on attention and detail. It looks so comfortable and fun too! So very fun. Love all the thoughtful creativity and follow through when this was transformed. Pencils, hall passes and the original lineoleum!! I so hope they’re insanely successful. This has got to be one of the cutest themes for a hotel I have ever come across. All the little touches have made such a world of a difference. The upturned tables in the banquet are so interesting…it still looks like a gym! This hotel has everything I love: Usually, hotels are very unique when installed in former….whatsoever buildings. Check. I love little, finally unimportant details – they show that your hosts really pay attention making your comfortable. Check. I love spacious rooms. Check. And beautiful bathrooms with some Asian touch to them. Check. I have to go! It’s so important for me for the hotels I stay in to have paid attention to the little details. I love the idea of Not Now” instead of “Do Not Disturb”sign. The rooms look fabulous as well! What a quirky little spot! I love the fact that they bring their history of being a school into so many of their design aspects. And it seems like a small enough hotel that every room is unique and you get a more personalized experience. What is there to do in this part of Iowa while you’re staying there? I love staying in hotels with history and character, looks like Hotel Grinnell would not disappoint! The creativity is so impressive, like your room key being a “hall pass” and repurposing the old lockers. I have family in Iowa and I can see the Hotel Grinnell being a fantsstic spot for a fun gathering at such a unique spot. Thanks for sharing your experience!